Is eating out in Venice expensive? The rumors are true. Eating out in Venice can be very expensive but fortunately for you we have made a “Venice Eating Out Guide” that combines not only the best restaurants in Venice, but also offers choices for those eating out in Venice on a budget. Eating out in Venice prices can range greatly so you have to be careful which is why we’ve even included some “Eating out in Venice tips” to avoid spending big while visiting this gorgeous city. From pizzas and cicchetti (tapas) to extensive tasting menus, we’ve got it all. 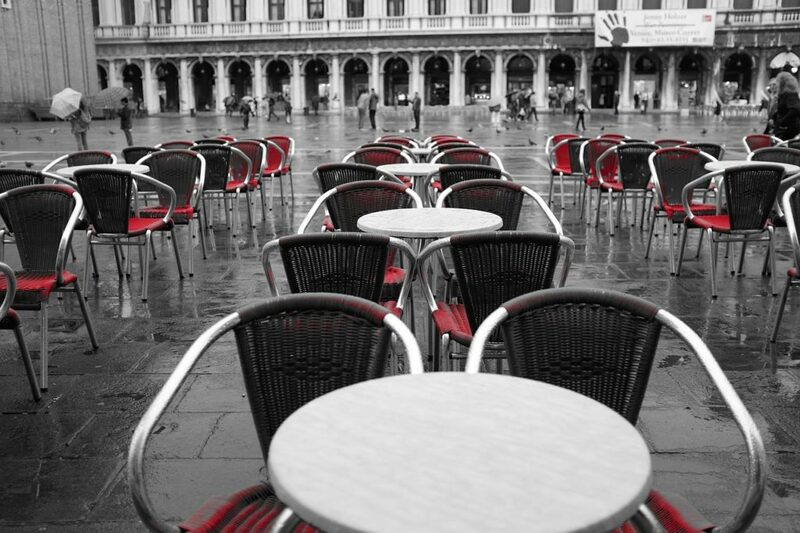 Venice eating out can be an experience rather than just a meal, so take it all in and enjoy! Easy, cheap and a great Venice restaurant take out option. Here you can get pizza by the slice or a full personal pizza to enjoy with one of their craft beers. No frills. Eat here or take a large pizza to go and share with your friends. Said by some to be the best pizza in Venice. Choose from 50 different pizzas to taste. This is the restaurant that you go to to really treat yourself. In other words, you will be splurging if you decide to try this restaurant, but (!) it will be worth it. Mainly tasting menus, with the option of some a la carte items, to share with others that are perfectly paired wines to go with each course of either fish or meat. Sorry, no vegetarian or vegan options at this restaurant. Hidden in the San Polo area and often visited by various celebrities, you will not find your typical Italian food here, but a delicious selection of seafood and an amazing wine menu that is moderately priced. A reasonably priced restaurant with a welcoming and cozy atmosphere that serves what has been said to be the best baccalà mantecato, a famous Venetian appetizer. Visit this Michelin-starred, romantic canal side restaurant run by Maurizio & Mara Martin for reasonably priced tasting menus including Italian classics. This Michelin-starred restaurant is directly in San Marco Square and has high Venice eating out prices. Open since 1830 and overlooking the square, you will be happy to taste this menu of traditional mixed with a touch of modernity. Get a drink before dinner at the Gran Caffè Quadri next door. This restaurant is certainly off the beaten path, so we highly suggest making a reservation here before trying to find it. Here you will find mainly seafood at reasonable prices. The beauty of this restaurant is that it’s not fancy and not touristy (yet) so get there soon! During the better weather months, you can venture to the beach-side area and experience Venice Lido eating out. Here you will taste some of the best seafood that Venice has to offer. We suggest trying Parco Delle Rose or Bar Trento for a great meal. Otherwise, the Gran Viale and the Riviera streets are full of restaurants that you can find alone or in the hotels that line the Lido. If you aren’t picky about your wines, always order vino della casa (house wine) that will always be marked at a cheaper price than the ones on the menu. Find a cute bar and have a drink and some cicchetti before dinner so you fill up on some great snacks first. Try Al Merca or Cantina do Mori. Make breakfast and lunch as cheap as possible. These should at least help keep your eating out in venice cost down a bit. We hope from this, that your eating out in Venice 2019 experience will be everything you hoped it would be.